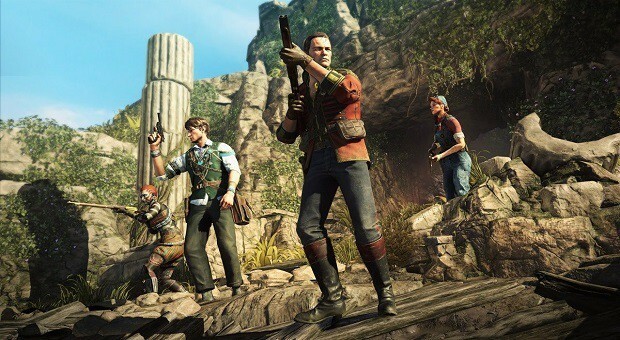 The latest game from Sniper Elite series’ creators, Strange Brigade, is filled with fun characters, each with their own unique set of skills and personalities. Since choosing a character directly affects how you’ll perform when it comes to gameplay, we’ve discussed each one in quite a bit of detail in our Strange Brigade Characters Guide to allow you to choose the one which suits your playstyle the best. As of now, there are a total of 4 playable characters to choose from. However, the developers have promised to add more content in the months to come. Thanks to some teases here and there, we know there’s a plan of revealing 4 more characters in the future. One of them being a brave cowboy by the name Patrick ‘Bash’ Conahan, the other being a pilot named Tessie Caldwell. The other two: a Japanese warrior Hachiro Shimizu and an Indian demon hunter Anjali Khan. We’ll have to look out for these. Now let’s breakdown existing Strange Brigade Characters in their entirety starting with our tank class named Frank Fairburne. Formerly served in the army, and thus has a unique eye for headshots and steady aim. Also thanks to all the training undergone as a soldier, Frank is able to take more hits before being down compared to the other characters. His primary weapon is the Westminster 1895 and his secondary is the Marley .45 Automatic. His unique item is dynamite for explosive damage. When his amulet power is fully charged, he can rush into enemies thanks to his Dynamic Dash, pushing them away and dealing damage in an explosive fashion. He can also acquire attributes upgrades like Tough Hide to increase max health and Super Headshot ability to perform explosive headshots to deal damage to nearby enemies. Being a demon hunter, Rushida is agile, quick to respond, and can perform some magical moves. Called a Spirit-Warrior in her lore, she comes equipped Chamberlain Automatic Rifle as her primary and Marley .45 Automatic as her secondary. Her item of choice is a Molotov for fire damage. As her special amulet power, she can bring down a super strong blast from the skies, dealing explosive damage to enemies within a certain radius. This ability is known as Raging Aura. As for her other abilities and attributes, she can increase her movement speed indefinitely and via the Vampire Strike attribute, she’s able to gain a bit of health on each melee attack she lands on the enemy. From England, Gracie brings her special talents and knowledge of explosives unlike anyone else. Moreover, she excels in close-quarter combat and melee strikes. Although she’s armed with a double-barreled shotgun Leamington Model 14 as her primary and Marley .45 Automatic for secondary, her real strength lies when she uses her grenade and her Typhoon Snake ability. This amulet power of hers allows her to pull enemies towards her and send them out as explosive projectiles. Moreover, she’s able to acquire attributes to speed up her grenade usage cooldown and deal melee attacks that have a wide radius. All in all, her shotgun and grenades keep the battle up close and personal, she’s your ‘get in the faces of the demon’ character. He’s got a keen eye for buried treasures and a knack for using magic to deal with opposition. He’s your mage and support class who’s able to help you uncover secrets including treasures and gather souls from a distance, thanks to his unique attributes. Armed with an SMG, Kingsley Special Repeater, and a Marley .45 Automatic; he also comes with a Sticky Grenade to leave enemies helpless. His special amulet power, the Beetle Blitz, allows hit to hit multiple enemies from a certain distance by extracting their souls. He can help you gain access to hidden caves and alcoves. This is all we have in our Strange Brigade Characters Guide. If there is anything else that you would like to add, let us know in the comments section below!